Here are some pretty default replacements for the neighborhood birch and oak trees and the individual Ginko, Redbud and Walnut trees that came with University. The textures have less detail and are darker/less luminous than the Maxis originals. These aren't "better" in terms of quality but after 15 years I think they're a nice change. These are all low poly meshes with small, low-res textures (exactly what maxis uses) and use the smallest number of textures possible with no duplicates. These will not place any additional demand/strain on your computer (or exacerbate any pink texture issues if you experience that). The downside is these are still low poly, low res textures just like the Maxis trees so you're not going to want to place these too close to your lots. The trees look their best from neighborhood view i.e. from above and at a distance. 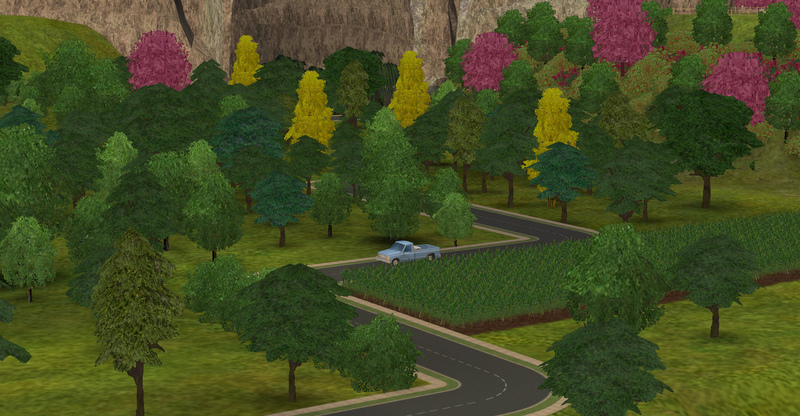 These are enabled for Seasons (although Seasons isn't required) and have updated Fall textures where needed. I removed the fallen leaves under the oak trees but will offer an alternate file that keeps the original ground leaves if anyone requests it. The winter textures remain unchanged. 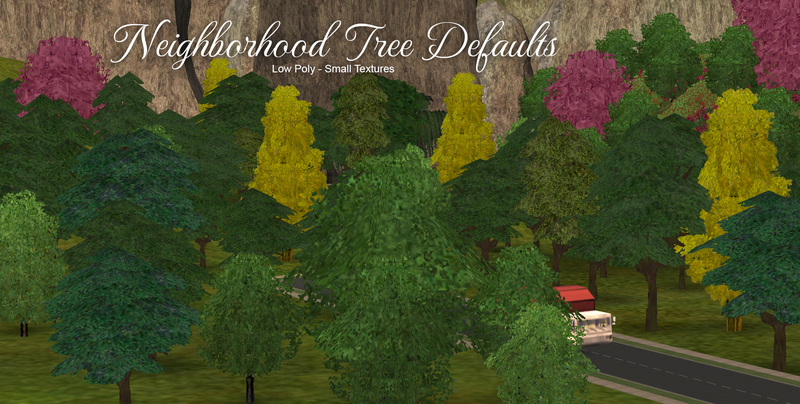 Criquette's Linden trees as default replacements by Lowedeus will conflict with my oak tree file. Silent Dragon replaced all of the neighborhood tree textures so some of their files will conflict with mine. See above pic for specific files that conflict. If you'd like to mix and match some of my trees with any of the above (very nice, higher quality replacements ) and aren't sure which files are which you're welcome to ask and I'll do my best to help. To jellybeanery, peppermint-ginger, jennamaxon, omorkvao and iCad who generously playtested and shared screenshots of these on tumblr - all of which helped immensely! I can't thank you each enough. Maxis for the textures, Photoshop, Milkshape, SimPE and MTS as always for hosting.